Place all pesto ingredients in food processor and blend until thoroughly mixed into a textured pesto sauce. Season 5 oz. salmon with salt and pepper. Drizzle roasting pan with olive oil and place salmon over it. 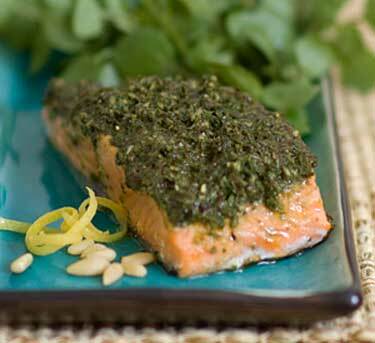 Spread pesto on the salmon and roast in oven at 375° F for about 10 to 12 minutes. Squeeze fresh lemon on salmon just before serving. Chef Notes: Also very good for sea bass, grilled steak, grilled shrimp and grilled chicken. Use as a spread on toasted bread topped with Jeff’s Garden Roasted Bell Peppers Strips and goat cheese.